Hey! 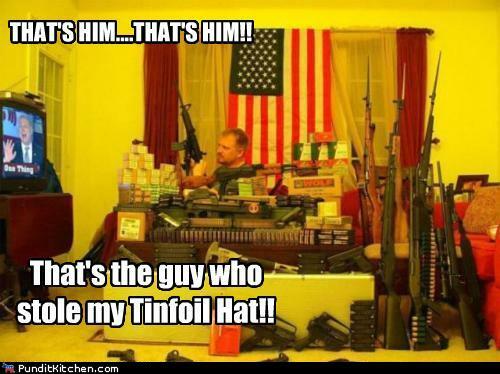 He stole my Tin Foil Hat! Don’t know if you can see who the guy is watching on TV, but it’s Glenn Beck. ‘Nuf said. Which one took your hat? I’m surprised his tv is intact. With Glen Beck on, mine wouldn’t be for long. Is your tv bullet free? yes, but I don’t watch much TV. I don’t even read much news on the internet, it’s just too anxiety provoking. Nothing I can do other than to make my family as resilient as possible, and to encourage reasonable discourse among my co workers….